Is it that hard to find information about Da Nang Asian Beach Games? 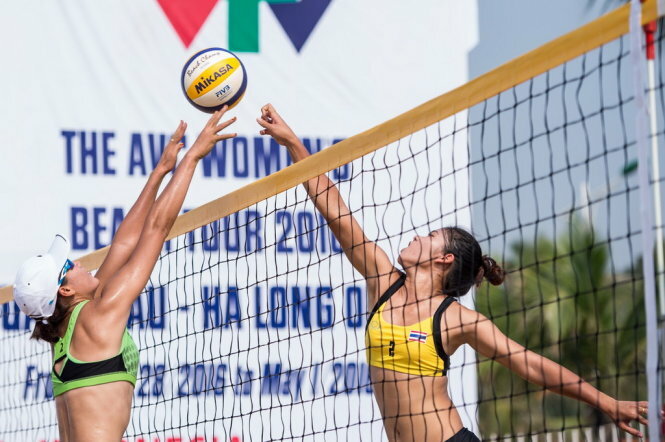 Two beach volleyball players compete in an event in Quang Ninh Province, located in northern Vietnam. I yelled at my laptop. You have to be joking, right? Seven hours later and I still haven’t found the main schedule for the 2016 Asian Beach Games to be held in Da Nang, with starting times of each event or ticket information. In a mind-bending attempt to track down the fabled files I moved over to Da Nang City’s tourism website promoting the Games, among a host of other events, but still no luck there. The Games’ official Facebook site seemed a little bit more helpful at first glance, until I realized that the Games starting time information I was scanning featured Olympic events such as the Shot-put, which I thought was alarming given some of the venues are right next to the coastal highway. I guess someone in the office doesn’t read English that well. Some helpful and kind Vietnamese locals have posted lots of photos of events and dates and even great photos of the venues on Facebook, in Vietnamese. This is about as useful as using Malaysian Ringgit to pay for over-priced coconut milk. VTV have also posted venue photos in Vietnamese, great for locals and but useless to foreigners. Local tour operators have also complained about the lack of promotion for the event. This is a golden opportunity going to waste if tourists and even locals find it hard to get reliable information such as starting times and ticket information easily on the Internet. As of this morning, the 19th of September, I have located some starting times by clicking on the official website http://abg2016.com/, going into ‘sports’ and being rewarded with the opportunity to download a TECHNICAL MANUAL for the individual sport. That is totally ridiculous. I’d probably have more luck finding a business visa for less than 500 dollars a year. For the participating countries it will come as a shock if the venues are only half full with spectators because no one can find basic details quickly. Modern sports events are usually planned and designed with the needs of more than one nationality or language in mind, and even small international events such as the Asian beach games can attract great interest from overseas tourists. The potential to promote Da Nang and surrounding attractions is huge in terms of media exposure. Look at how any Formula One coverage features the host cities, or how tennis and international football tournaments also feature background clips on what to do in each host city. This is priceless advertising, but it’s pointless unless people fill the venues and know what’s going on around the city. Surely the authorities can do more in the next few days to address the information gaps on both the official website and the Da Nang tourism site? I rang the Da Nang hotline by the way and, after pressing ‘6’, got an English speaking operator. She was helpful but couldn’t give me the starting time for the beach volleyball as it hadn’t been announced yet. A number of events still don’t have official starting times, which is also not mentioned on the website. With a week before the opening ceremony this also makes it hard for visitors to plan their days. In the time of smartphone apps, I believe the organizers of the Games should do more, quickly, to alleviate the concerns of sport lovers unable to plan with some certainty the sports they wish to see. If Da Nang can get this right then its reputation for handling large events can only improve, and attract even more interest in the grand central coast city. Anyway, I wish the organizers, sportspeople and spectators a happy Asian Beach Games! Now, where do I find the Beach Petanque?